My answering your questions involved no patience whatsoever. I’m enthralled with this project (as you could probably tell), and every question answered is that much more pleasure for me. Low-tech is beautiful. How do you build a confetti shooting box anyway? I’m glad you have the insight into human nature: we love to play! The Confetti box was just a small battery operated hand fan with it’s blades placed through the bottom of a disposable foam bowl filled with confetti. (Imagine making a cake without adding the liquid ingredients, and switching on the electric mixer. The dry ingredients fly will out!) Opening the box plucked out a small piece of paper from a clothespin, which was wired to complete the fan’s circuit. I actually had to make them in bulk. I needed 30 of them for holiday gifts. They had chocolates in the bottom. Also, my wife set a budget, but I was able to do them for less than $5 apiece (minus chocolates). There have been 2 other designs since then, but they are a little hard to describe in text. BTW I’m making progress on my reverse Geocache box! Thanks for the inspiration! I have been geocaching for six years and love your idea. Please keep us all posted on how it turns out. I am very interested in building a puzzle box. I have been looking at the page but really there are no instructions. I can order all the parts but need to know how to put them together. Is there any help you could give me? 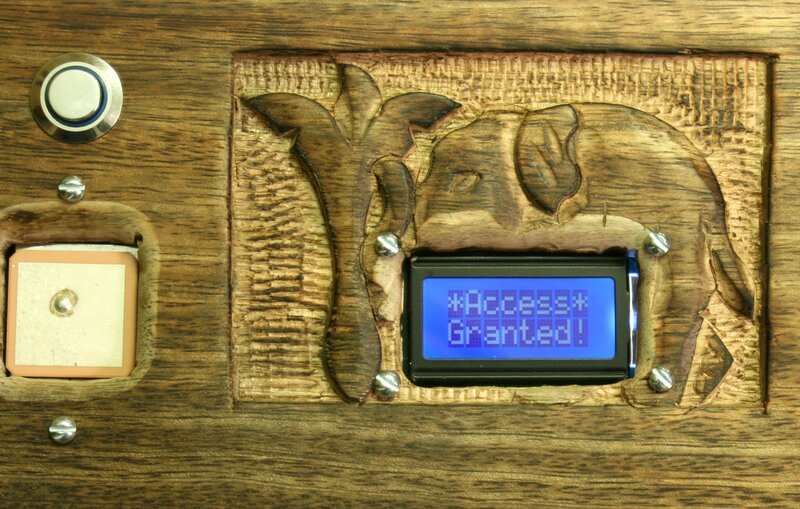 How can I get a reverse geocache puzzle box? Can I order one, or is there some place that I can track one down now? This is a fantastic addition to an already wonderful activty. Thank you for your effort! 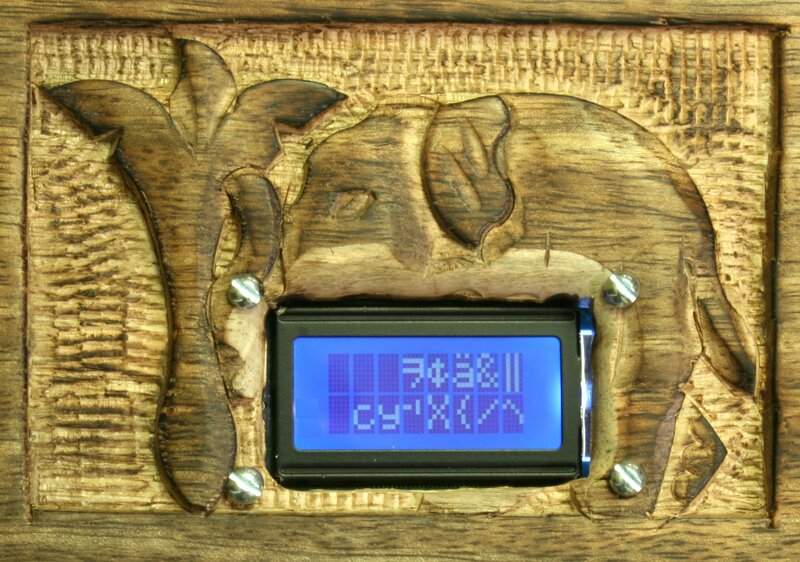 I should be posting some instructions on how to build a very basic puzzle box in the next few weeks. 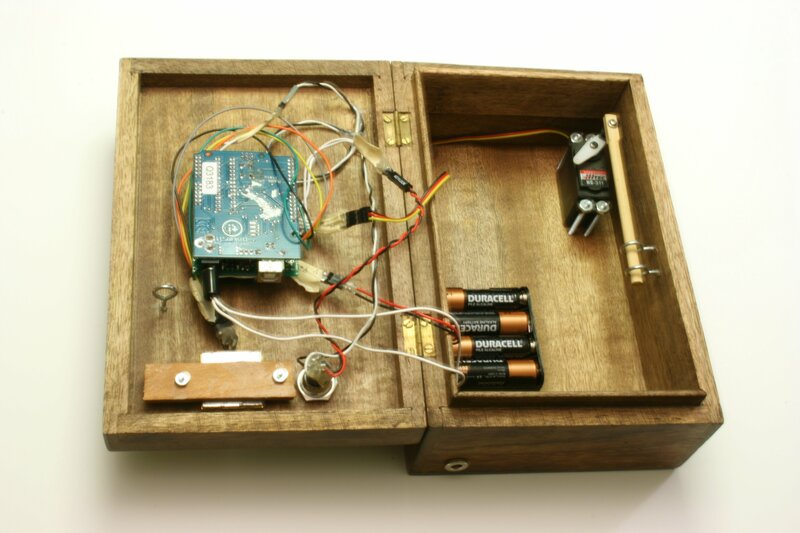 Have you posted anything on how to build a reverse geocaching box? If so could you send me the link. 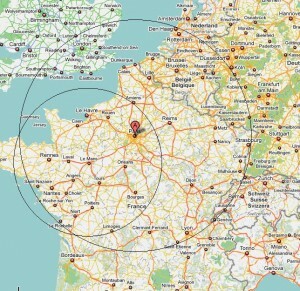 I am thinking about making one for a proposal, how small of a range do you think you could have for the destination. 2000 meters just seems a little large and would like to try like 100 meters if that would work. Troy, in my customizable boxes I find that radii of as little as 10-15 meters work fine. I can define the magic spot where the box opens at the front door of a shop, and not at the shop next door. The EM-406A GPS unit that I use has a published accuracy of +/-10 meters. 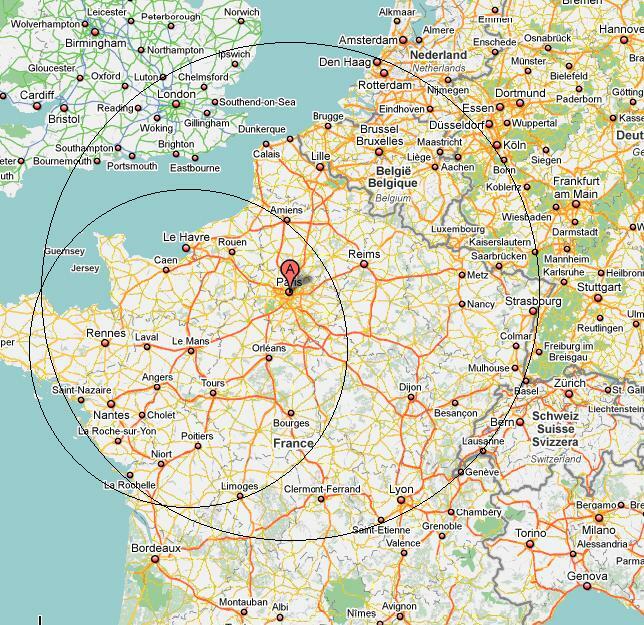 You’d only use a radius like 2000 meters if you wanted, as I did, the box to open anywhere within a designated region, like on my island. I love your Reverse Geocache puzzle! I am looking for someone to make one for me. Any ideas of who would be willing to do it? @Reina — Sure, send me an email. Mikal, I am in the process of obtaining all the hardware to make one of these for my wife for our ten year wedding anniversary. 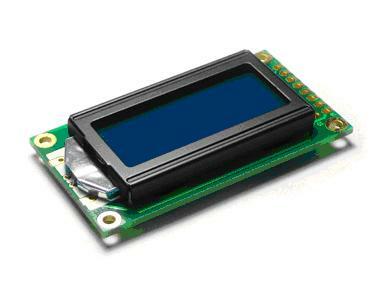 As far as the LCD goes, is there a reason I would want more than the 8×2 LCD? If I wanted to have a message longer than eight characters will it just scroll across? I love that little 8×2 display because it’s such a vibrant blue and because it is so small. There’s an aesthetic with these boxes that compels you to make the visible electronics as tiny as possible relative to the rest of the construction. 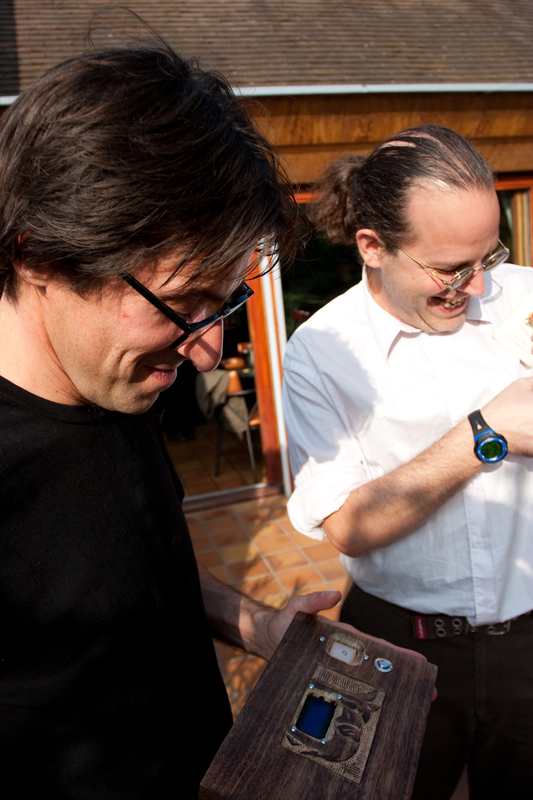 That increases the impression that the strange object you have is a found artifact–which is good! That said, a bigger display would work. But there is no automatic scrolling. The boxes I make do have “fly-in” and “fly-out” messages, but this is custom code. Mikal, thanks for the reply. I am having difficulty finding an illuminated push-button. Do you have another source for one? Mikal, never-mind about the switch, I found you link on building and thanks for all the info. Thanks for the tutorial in Make magazine. I’ve just emailed you about a shield for this project, but leading on from the question about LCD’s. I’m trying to source the components within the UK and can’t seem to locate a suitable 8 x 2, but can find a 16 x 2 in a similar blue (http://www.skpang.co.uk/catalog/product_info.php?products_id=176). 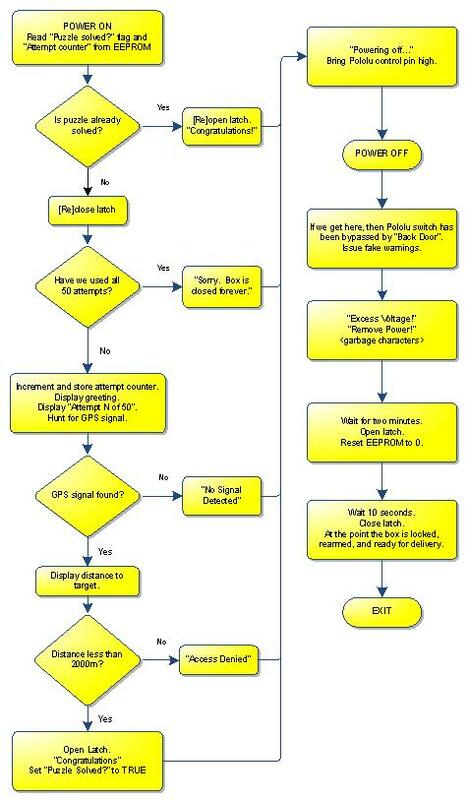 Should this work with your code? 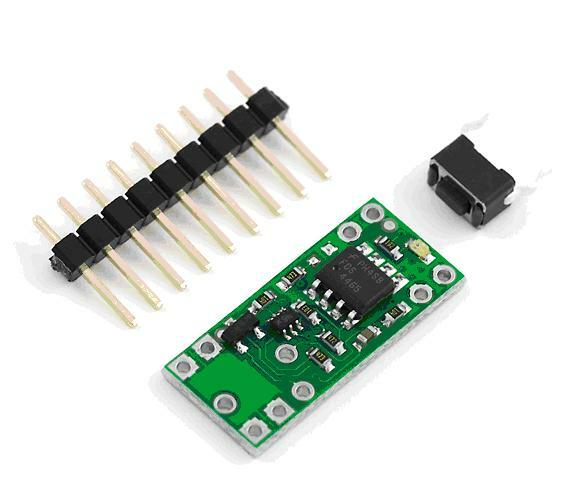 But the main issue is that the 8×2 connector on the shield is designed to perfectly mate with that cute little 8×2 display with a simple ribbon cable. 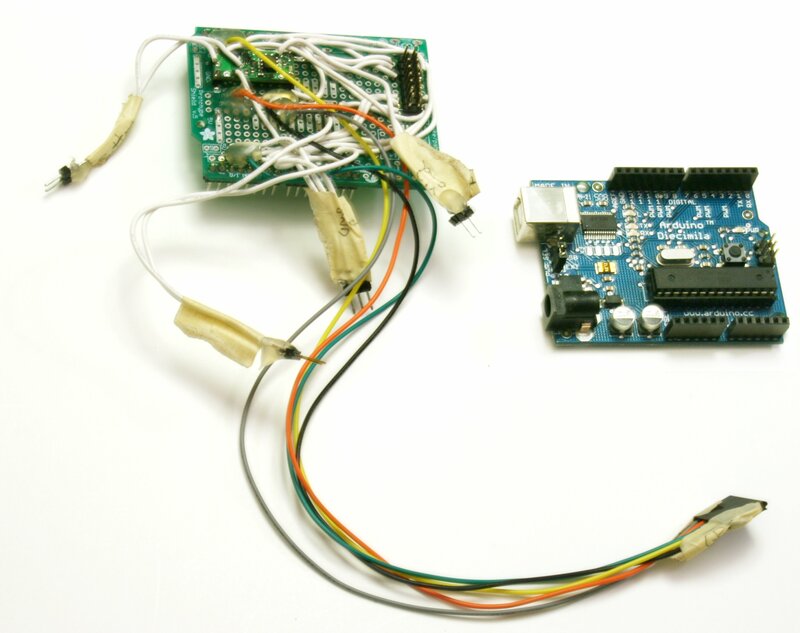 If you use a 16×2 display, you’ll have to manually wire it up. But it will probably work. 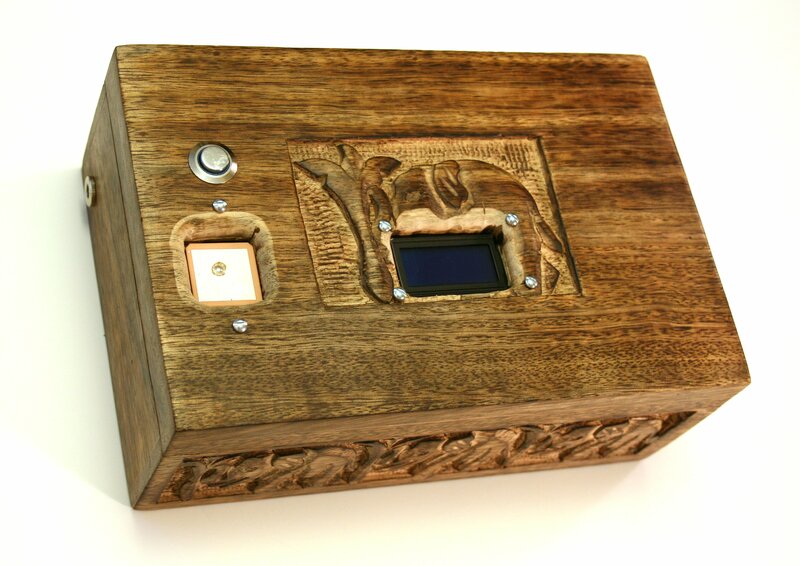 I was wondering how I could go about getting a reverse geocache puzzle box built. I notice in one post you told the person to e-mail you but I couldn’t find your e-mail. 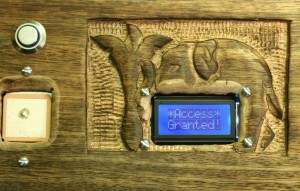 For commissioned work, contact me at mikal (at) arduiniana.org. speechless…. What a nice concept!!!!! Love it!!! Where did you get that pushbutton switch? What did it cost? Skippy, I link all the parts on the build page. Thank you for such an excellent idea. I decided to make one for my (now) parents-in-law as a thank you for helping my (now) wife and me for our wedding. This was in the days before you posted the basic instructions (and published the code >_< ) so I was starting from scratch with just your description and photos to examine. Man, it was a lot of fun and it took over my dining room table for most of a month. It successfully opened for them last Thursday and they really enjoyed the idea and the hunt. I wanted to set a tight tolerance (~ 10m) on the location so that they had to be standing right outside a particular B&B doorway before the box opened. Since they were taking their initial triangulation readings from a few 100km distant and it wasn't convenient to perform triangulations while on the road, I put in an extra function to counter the initial inaccuracies of triangulating over a large distance. Once they got within a couple of km of target, the box additionally gave them a direction to head in e.g. North West, South etc. This was 5 minutes' worth of coding and uses a pretty basic equation. I built the box in Australia and had to take it with me to the UK fully assembled. Seeing your concerns over flight safety, I got in touch with Qantas security before flying. The general message was not to worry about it. Security staff aren't stupid and provided there are no large masses within the box, they're pretty used to spotting hobby electronics on x-ray. If you're worried about it, mention it to check-in staff and make sure it's well-labelled in your suitcase. My bag didn't even get opened for inspection. Thanks once again for such a brilliant concept. It's given me and my new family a lot of fun, although wife will lament the loss of the dining room table. 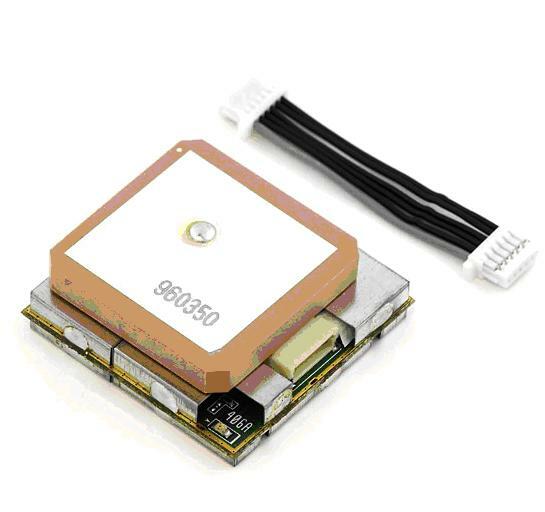 Would you be interested in building one of these devices for sale? I am interested in purchasing one but am not savy enough to build it. If so, it would be greatly appreciated. Feel free to send me an email. Thanks. Thanks so much for terrific message. I think my favorite part of all this are the cool stories that are generated by other people. Can you share some more detail? Like what was in the box? A gift certificate for the B+B? What town? Can you share the name of the B+B? I have a fellow working on a box which will take his daughter to a beautiful rural park where she’ll find her extended family at a surprise cookout and a shiny new car! Can you guess what was in the box? Yep, you got it. A set of keys to the car! At some point I would like to better understand your comment about “the inaccuracies of triangulating over a large distance” and how you correct for this. Thanks again for the kind message; it made my day! Hi, this is one of the coolest things I’ve ever seen! It is such an awesome idea, and it’s great to see some creativity in this world haha! I saw you instruction link, but I was also wondering about just purchasing one; I did see where you told people to check their e-mails regarding purchasing one, so if you could, please send me an e-mail regarding buying one. Thanks!!!! Interestingly, I am in the same situation as the other Dave. I would love to have one of these boxes, as I am preparing to ask the love of my life to marry me. However, as with the last Dave, building my own is not an option as I lack the intellect. This box is perfect!! PLEASE e-mail me with any help you can provide. I loved this idea when I saw it in MAKE, and hope to build one… someday. I’m sure you get suggestions all the time, but have you considered a “Brigadoon Box?” (I just made that up; I have no claim to that name). This would be a box like your original reverse geocache, but with the added element of time. 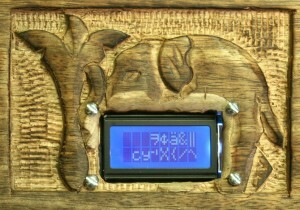 The Brigadoon Box would only open at a certain place, ON A CERTAIN DATE (or ever a certain time). Like, say, Stonehenge at the summer solstice. New Years, midnight, Times Square. Sunrise, Christmas morning, grandma’s house. Anyway – might be fun to try. I agree that’s a good idea, Eric. My new firmware will support the ability to set both (or either!) a destination OR a time for opening. You could create a box that only opens when your grandbaby’s 21st birthday. mikal, I would like to buy at least one… is it possible? I really like this idea. I am glad I found this on the internet, this was well worth reading. I was actually considering making a box similar to this, and you have impressed me enough with this that I am motivated now. amazing. Mikal, GREAT idea! I would love to have one of these, but there’s no way I could make it myself. Could you e-mail and let me know if you’d be willing to sell me one? Okay my question is very simple. CAN I BUY ONE OF THESE BOXES :) PLEASE ? Sure! Check your email. I make lots of them. Simple answer too: yes! :) I’ve made lots of commissioned boxes. We’ll talk by email. Thanks. please let me know what one of these would cost – I am getting Married in August and would love to present my husband with one – now I must think about the contents – and a location..
3 words. I LOVE YOU! Can i buy one for my husband for our anniversary in May 2012? 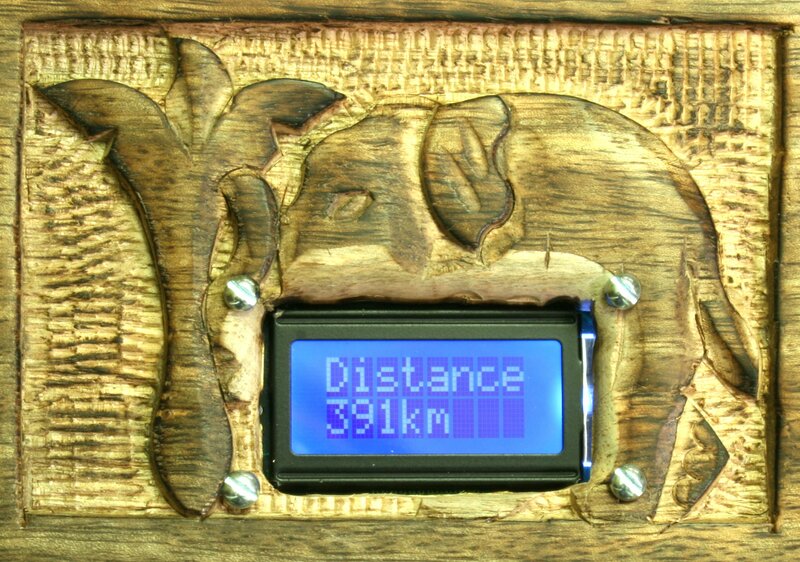 He has done some personal projects using the Arduino and we’ve recently got into geocaching together. I would have a go at building one but it is beyond me if im honest. @Jacq–I love you too! :) Thanks for the kind note! Yes, I am building commissions regularly, check your email for details! I love your idea of making your own reverse geocache. I have some questions on making my own. Can you get in touch with me through my email address?? Thanks a lot. This one of the most genius and creative gifts I have ever seen! How much does something like this cost? Would I have to send the contents of the box to you? Bernard, did you see my page on building your own at http://arduiniana.org/projects/the-reverse-geo-cache-puzzle/building/? Thanks for the kind words. I have made many custom boxes from about $550 to upwards of $3000 depending on the level of customization required. My boxes are all configurable from a PC. You don’t send me the contents; you put the contents in the box and then select your destination on the PC console using some configuration software that I wrote. The software controls all aspects of the box, so you can have as many adventures as you like.